Biker Date Link is a niche dating website for biker enthusiasts that just want to have fun. It is a good place for riders to find a quick hook-up as there are several other biker singles on the platform that just want to date biker men or biker women with no strings attached. This biker dating site is new and therefore does not have a huge user-base like its competitors in the biker dating niche but it is a sure platform for motorcycle riders to find a quick flirt. It has basic features like you would find on any dating site and its subscription plan is affordable. Read our detailed review on Biker Date Link and learn more about its features! Registration here is simple and you can complete it within a minute. You will need to choose a username, password, email, birthday, country, gender, and ZIP/ postal code. After this you can go ahead to build your profile, modify and add your photos. When you have successfully built your profile, you will be able to browse through the list of available members and you can initiate conversations with them. You can also use the search tool to make specific searches on members. You will have access to dating tips on the site to learn about ways to detect and avoid scammers. With its video chat feature, you can easily learn peoples behavior and know if they are truly who they claim. You need a subscription plan to enjoy unlimited access to all features. There are no background checks on members which gave room to several fake profiles in the site. Biker Date link is a cool platform for bikers that wants to enjoy chats and dates with interested members online. It has a beautiful UI design and it is easy to navigate. One of the special features of the site is the video live chat. You will be able to see who you are communicating with and you can know if they are for real or not. It comes with a subscription fee to enjoy all the features and it does not have a huge user-base since it’s a new site. 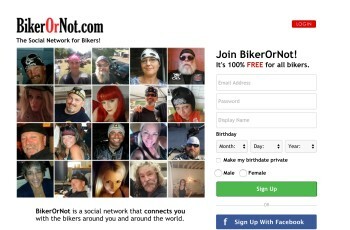 Although Biker Date Link claims to be a biker dating site, it does not have special features tailored for bikers unlike its competitors in the same niche that still provide news on motorcycle events amongst others. However, it is a good platform to find quick hook-ups or romance with no strings attached. If you are a motorcycle enthusiast that just want to have fun with biker men and women from other parts of the world, or you are a rider that wants to try biker dating with biker singles online, you should check into the site! You can build a profile and upload your photos. You can browse through the list of available members, check their profile and view their photos. You can send anonymous emails and enjoy a live chat with other members. You can enjoy video chat with other members. You can make searches based on criteria like age, interest, gender, location etc with the search tool. You can add your favorite members or people you want to frequently keep in touch with to your “hot list”. *Visit the website for the latest Biker Date Link pricing.